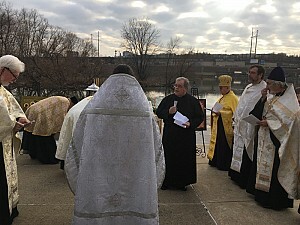 On Sunday January 21st 2018, the Orthodox Clergy Brotherhood celebrated the Great Blessing of the Waters of the Schuylkill River in Philadelphia PA.. Clergy from the Albanian, Antiochian, Georgian, Greek, OCA, Russian, Serbian, and Ukrainian parishes gathered to celebrate a unified Orthodox witness to the public. President of the Clergy Brotherhood, Fr. Nicholas Dellerman, led the clergy in the celebration. Responses were sung by the Pan-Orthodox Choir, under the direction of Dan Drobish. 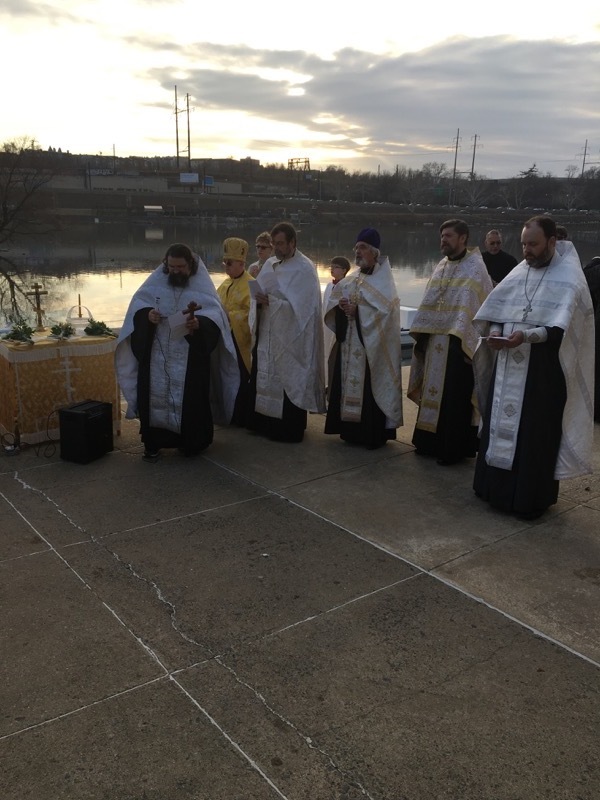 The celebration concluded with the casting, by the clergy, of three crosses craved from ice into the Schuylkill River, while the Choir sang the Festal Troparion “When Thou, O Lord, was baptized in the Jordan…”. Following the blessing of the faithful with Holy Water, a luncheon reception was held in the Fairmount Rowing Club, on whose premises the Great Blessing was conducted. On behalf of the Orthodox Clergy Brotherhood, Fr. Nicholas Dellerman graciously thanked V. Rev. Thomas Monnat, representing the Anglican Fellowship of the Delaware Valley, whose assistance enabled the Clergy Brotherhood to realize this celebration at one of the most eminent rowing clubs of Philadelphia’s famed Boathouse Row.